This is my attempt at ‘interactive’ art. What I mean is, I’d really like your input on these 3 paintings. I’ve asked my mother & husband, but Mom is always incredibly supportive and Hubster just nods his head. Not the candor I’m looking for. 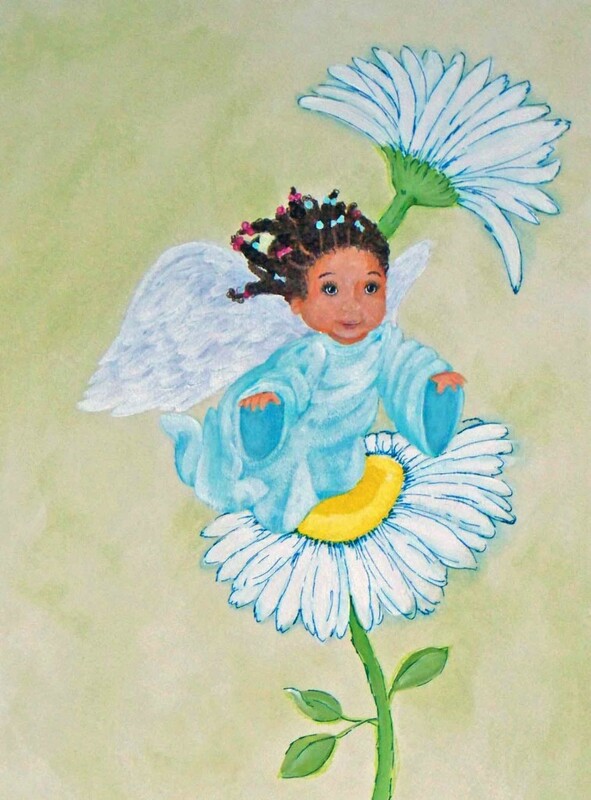 If you missed why I’m painting African American angels, you can read about it here. Now, this is what I need your input on. If I keep the daisies, should the petals be detailed more. You’ll see what I mean on the Blackberry #2. Do the white highlights on her face look funny? See how the daisies are more defined? Does this look better than the daisies in the first? Again – should I take the daisy out altogether? Or leave it in as is? Or add the turquoise details like on the first 2. You can see that I drive myself nuts (and anyone around me). It’s so much easier when I paint for someone else and they give their stamp of approval. Hubster tells me I act like these are the only angels I’ll ever paint. And they’re not, of course. I’m moving on to fairies and princesses this week. That’s why I’m questioning the daisies. I feel like they’d be more appropriate for fairies. I guess I can Photoshop them out. Of course, I have to learn how to do that first . . . ugh. I’d really, really love to hear your ideas & comments. Really! These little black angel girls will be reproduced – my first reproductions – which is probably why I’m in such a quandry. Thanks so much for your ‘interaction’! I’m linking up to the crafty gals. Have fun checking out what everyone is doing for spring. I like the daisy’s. I like the one in the second pic best. I do get what you are saying about fairies being more likely to be amongst flowers though, but I do like the daisy’s. Maybe you could turn them into sunflowers! I like the highlighting on the last angels face, but the fist one seems to have a little too much. Those are just my opinions – hope they help! Overall I would say beautiful! Hi Colleen…WOW..they are so adorable!!! Now from my artistic eye…I like the daisy in the #2 pic best. I think the highlighting might actually need to be a deeper shade rather than a lighter one. I know this doest help, but personally, I think they are perfect! I found you on TCB. I love the little angels and appreciate that the little girls have beautiful natural looking hair. The daisies in the first pic are my favorite. I agree the highlights on the first pic are a bit much though. It looks like she’s been playing in flour. I don’t know on keeping the daisies. They are sweet and whimsical but I see your point. Great job!!! They are beautiful – you are so creative! I have a hard time but i think #2 is my favorite. I have no artistic ability whatsoever. But, since you asked for opinions – I like the first daisy best. And I think toning down the white highlights would be good. But, they are great already!! I like the daisies, they look cute. My favorite daisy is the first one. I like it with the blue highlights, and I like that it’s not as defined as the one in pic # 2. As for the white highlights on the face, I do think toning them down would be better. Love the angels!! Especially the first! She is precious. You may consider a slight blushing of color on the daisies. I did not notice the angel wings in #2 at first. I know you want the angels to be part of the garden, but a bit of differentiation would really set them a – part! Great job! I think I really like the first one! She is super cute! I think the daisies look fine! But I am not an “artist”. You really are a perfectionist! I like the second baby the best, but I’m not exactly sure why. I think it’s the most cherubic. Your angels are precious! I particularly love #2 and the daisy in that one! I love your daily law of attraction quote. I am a firm believer in that too! My husband is African American too! My kids are very pale, but my daughter sees herself as black. I try to buy books and other stuff with black characters. The angels are cute!!! Thanks for linking up at Whatever Goes Wednesday. I hope to see you back next week! Thank you so much for visiting my blog! I thought I’d come and take a look here and boy do you do a good job with paint As for your questions. I like the daisies, the turquoise ones better than the pink. I’m sure angels like flowers too so I don’t have a problem with leaving them in. The flowers in the first one works best in my opinion, they’re there and they’re beautiful but they don’t steal the show. The highlights are a little out of the ordinary and could be blended in maybe for a more realistic appearance or left the way they are, could be your trademark? I kind of like them since they’re different But I’m all about different. You are so talented! 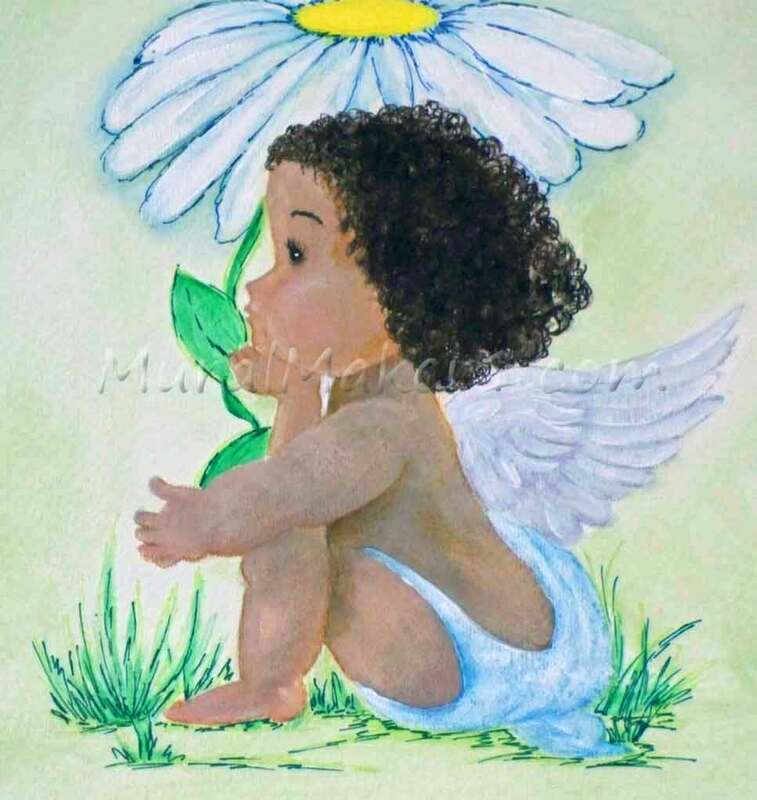 I love the face on the first little angel, and I think the daisies are so sweet. The second one might be my favorite, but it’s hard to decide. Thanks for joining the blog party and your sweet words! I love them with the daisies. Love the 2nd one best. Thanks for sharing at the Power of Paint Party. I think the first one is perfect as is. The last one, the expression just seems off a bit, like she’s blowing her cheeks out all puffy, maybe. I love it!!!! I will be back they reminded me of when my girls were small!